Awesome side by side family beach houses . Rent 1 or both . This spacious 1800 square foot home is perfect for family & friends to gather or for couples looking for a romantic getaway, Anniversary, Birthday, or special occasion. Great OceanView location and fabulous views make this the ideal home for those looking to relax in a clean, comfortable and relaxing vacation home. An oversize kitchen and dining area makes entertaining a breeze. Everything flows out onto a 1,000 sq ft Oceanview cedar deck with the Hot Tub just steps away.. Each of the bedrooms have its own warm and inviting atmosphere including new BeautyRest Pillowtop Mattresses for your ultimate comfort and enjoyment. For those that can't seem to get away from the office we have WIFI Hi-speed internet connection with wireless router. For kids young and old we have 7 miles of warm sandy beach for Exploration and Adventure. We also have 2- 42" large flat screen Plasma TV's for action packed games, Sports,movies, and 2 Sony Blue ray players . Netflix , Amazon Prime , HULU and other online entertainment services are accessible and available . The sunsets, whale watching, kite surfing and ocean views are simply spectacular. Don't forget to stroll over to the beach access to catch the fabulous sunrises,sunsets and scan the incredible coastline in all its wonder. Terrific home, fabulous location,Great Oceanview. Includes Weber BBQ. Short one block to two beach accesses. Located just a short 1 mile drive or walk from the Chinook Winds Casino and only minutes away from two 18 hole golf courses (Lakeside and Salishan). Any other questions we can answer for you ? We are happy to assist with booking when you are ready. We believe if we can get it down to the only thing you need to worry about is having a good time then we have done our job. We are happy to offer early checkin, late checkout ,and special requests whenever possible . Happy to help any way we can . 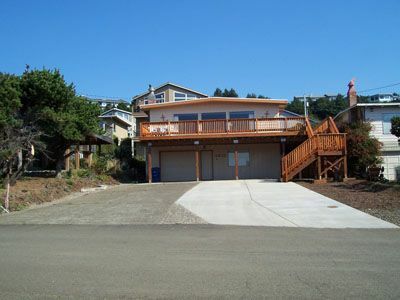 The City of Lincoln City ,Or limits occupancy to 16 at all licensed Vacation rentals. Had a great weekend at this beach house. Great location just a short walk from the beach. Beautiful patio with a view of the ocean! House was equipped with everything we needed. Excellent owners who were very accommodating. When we come back to visit Lincoln city will definately check this place first! WE found everything as advertised. Great view of the Ocean, with plenty of room for the nine of us. The view is amazing the house is spacious and beautiful, with every amenity you could ask for! We had wonderful time at the beach and will rent again! Absolutely loved the new changes. Would definitely recommend. This property has everything you need. Just bring your food. Can’t wait until our next stay. We loved the stay. We enjoyed the house. My dad oived the deck and the view for his 81st birthday.Thank you Ken for the great place to relax. We will be back.